Assessing Window Fit-This One was Rejected! If you've never installed windows in a car, you’ll be an expert by the time you are done with your Heinkel. There are 6 windows to install by “traditional” methods, plus two quarter vent windows that swing out on a pivot (We’ll talk about those later). Let’s start with the windshield, since it’s the easiest to install, has a forgiving fit, and the lessons learned carry over to the other windows. Appearances can be deceiving. I held the windshield up to the frame, and my first reaction (as well as everyone else's) was that the glass was too small. There appeared to be too big of a gap, seemingly an inch when there should be no more than a quarter of that. 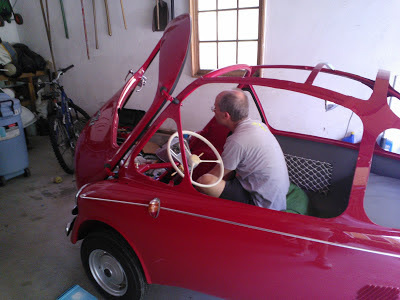 I thought to myself, “maybe I have a BMW Isetta windshield here?” I had two other windshields, and they had the same apparent sizing “issue”. I had to readjust my perceptions in order to install the windshield. How Does the Windshield Install? The original windows had a nice one piece rubber seal. Unfortunately, the rubbers were 50 years old and, while they weren't in terrible shape, they were not good enough for the kind of restoration I was contemplating. I purchased replacement seal by the meter from the UK club, which I cut to length. There are a few methods to install windows. Having never installed a window I went out to the internet to determine how it was done. 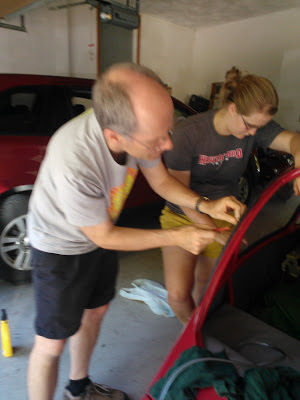 I kept seeing references to the “soapy string” or fishing line method, where you use a piece of string wrapped around the rubber window gasket, which in turn is wrapped around the glass, to act as a lever to lift the seal around the inside body of the car. 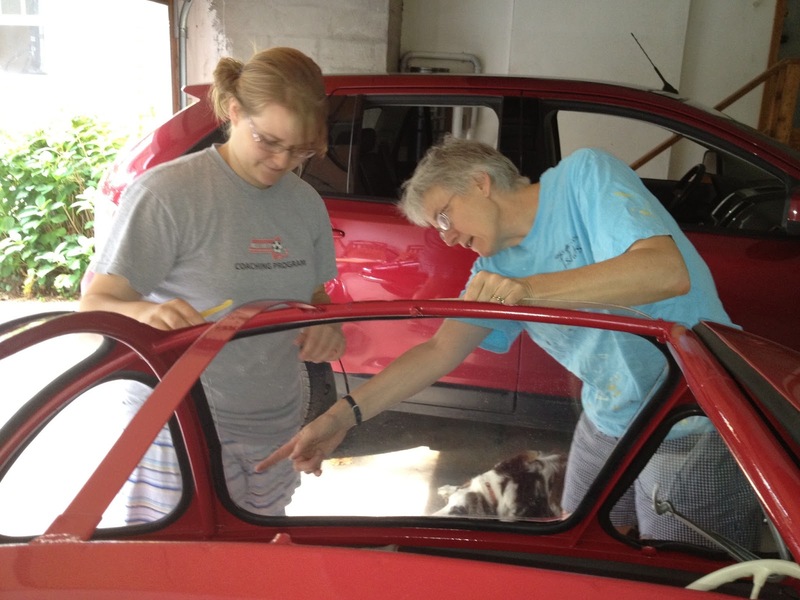 There are even nifty videos of people inserting VW bug glass windshields into place in the time it took me to write this paragraph. Clearly this was the way to install a window. Not! I tried and tried, and I could not get this method to work. I had to come up with a different solution. 1. Measure the amount of rubber seal you need for the window. Over estimate by a little bit (you don’t want this to be short). 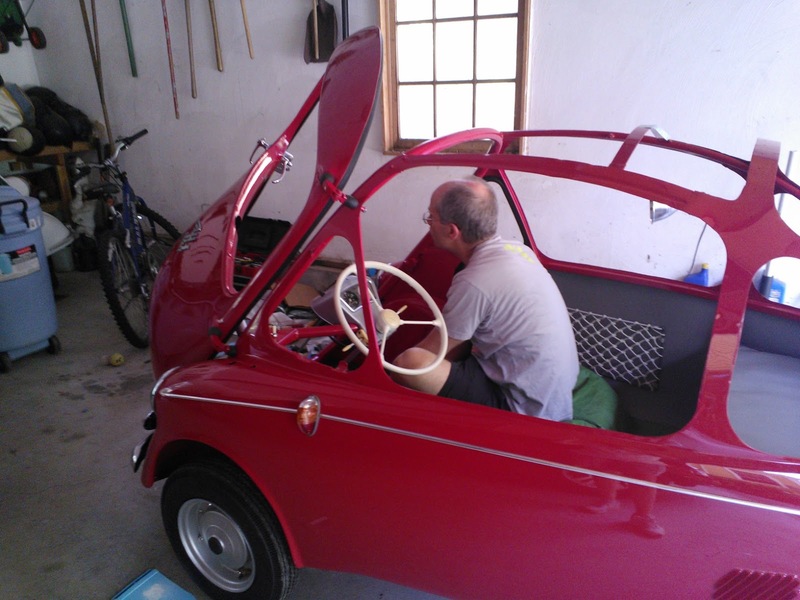 You can install the gasket onto the car body as a test fit to make sure your length is adequate. It’s important to note that front windshield rubbers are different than the other window seals. 2. Get a couple of friends, and position one inside the car and one outside. They are going to postion the window while you work the seal into place. 3. 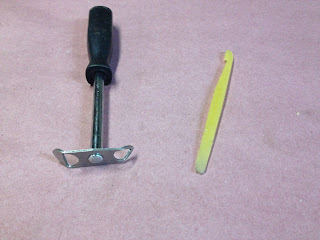 Start by placing the seal onto the car, using the grapefruit tool pictured to get the channel onto the body. 4. Place the window into the seal, preferably on the opposite side of the loose ends of the seal. I usually start at the bottom. 5. Then put the bottom edge of the glass into the channel, have the people hold the window in position, then use the grapefruit tool again to get the lip of the seal to cover the window. 6. It helps to have the loose ends of the seals be near the last part of the window. 7. You can use a tad of silicone spray in the corners if you get stuck. 8. You should now have the window installed, but it needs the locking strip to secure the window. Using the window locking tool, insert the locking strip in the groove and proceed to install it around the window. 9. Leave the locking strip about an inch longer than needed. After you cut it, compress the plastic channel lock to install it. The extra length will compensate for any parts of the channel lock that were overstretched during installation. Now that you've installed the windshield, you are ready to move on to plastic windows. The challenge with the plastic windows is that they may need to be cut to size. If you purchase new windows you will need to cut them. You may also need to cut them if you've done bodywork that affects the window openings, or if you are installing windows that were not originally from the car. Let’s talk about how to fit and cut the windows. Fitting the windows is much easier with a friend. Have the friend hold the window up to the opening while you use a Sharpie to mark the opening. You generally want about 1/4" clearance between the body opening and the window to leave room for the seal. Because of the curve of the windows, especially the bubble, you may not be able to get it exact. The downside of this is that you may install the window and find the fit is not optimal, and you’ll have to remove it, trim the window, and try again. There are a couple of ways to trim these windows. The best and easiest involve power tools. I would strongly advise against using a knife and scoring; the chance of an errant cut and resulting scrape is just too great. Many people have sanded the windows to shape using a drum sander or belt sander. You just need to be careful about generating excess heat, as you will melt the plastic and clog the sandpaper. 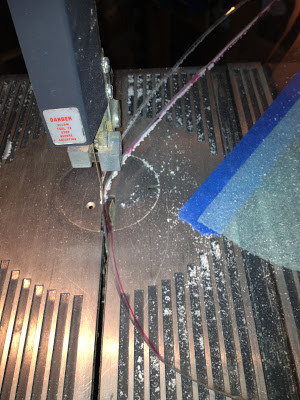 I cut the windows on the bandsaw with a 16tpi blade. I taped protective coating over the windows so I wouldn’t scratch the window on the saw table. Then I just cut the windows. It was pretty simple. 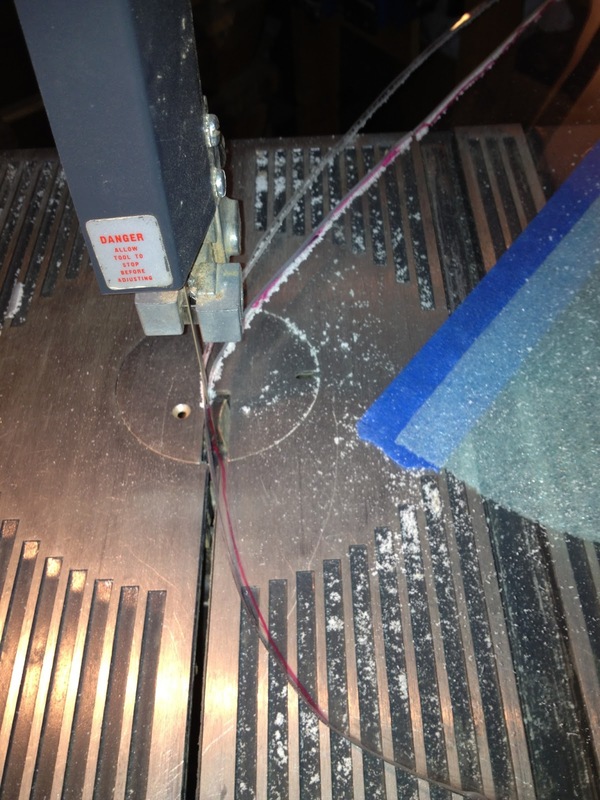 Plexiglass does not chip like polycarbonate. Then I sanded the edge slightly with a drum sander on my Dremel. Don’t be surprised if you have to trim a window several times before it fits. (I told you that you’d be an expert at window installation by the time you were done!). My final advice on window installation is to get your car running optimally before you install the bubble. 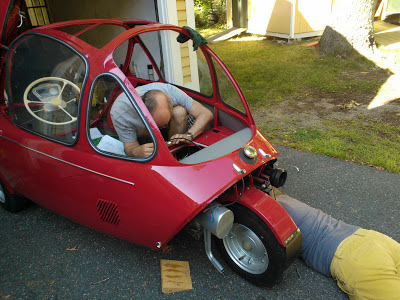 It is so much easier to adjust the engine with the window out. Just reach in and out; otherwise you have to get out, walk around, and get into the car to work on it.